Taking care of kids is a very difficult and demanding task so it is especially difficult for babysitters to take over. Fortunately, if you are leaving your kids with a baby sitter for any period of time it is easy to make their job easier with this simple child care log template that you can download. The idea is that if you leave a good checklist with everything that needs done the babysitter will be more likely to get the job done correctly. First of all, you should know that the child care log template is completely free to use and download so it will not cost you anything to get started. The entire thing is customizable and changeable so you can make sure anything and everything you need done is listed, and the entire thing is incredibly easy to use. 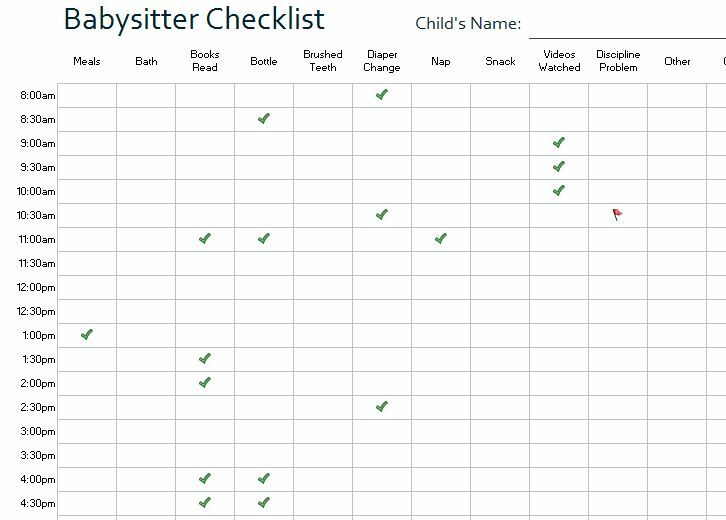 This child care log template really is a breeze to use so you should definitely try it out next time you leave the kids with a babysitter or relative. Using the child care log takes just a few seconds, so it really couldn’t be any easier. Once you open up the Excel template you will see a list of common activities or chores that need done as well as a timetable. All you have to do is select the specific time each of these needs to be done by and the child care log will be complete. Obviously it is only as good as the information you put into it but as long as you list anything and everything that needs done you shouldn’t have any problems making sure all of the important pieces of child care get taken care of while you are absent. Stop wasting your time writing out messy handwritten notes that never get done, this log will make it quick and easy for you to show a babysitter exactly what needs done and when it should be done for each of your children. Plus, it is free so why not give it a shot and see if it improves your babysitter’s performance next time you need one.